Lunula is an ancient symbol of feminine power. Traditionally, it is made in the form of a crescent moon since it represents femininity and has tremendous power! This pendant was worn by girls from a young age, which provided protection from evil eye. Traditionally, this pendant was worn by a girl until marriage, and then the pendant was taken off and burned along with the toys. This symbolized that she started a new path in life, moving to a completely different stage. The Lunula Pendant Sterling Silver Female Charm for sale is not just a stylish jewelry, but a centuries-old heritage as well. Every product is made according to old drawings used by craftsmen of the bygone era. You can order Lunula Pendant Sterling Silver Female Charm that is entirely handmade because it is necessary to create such an accessory. The same is true for all other products, including the Lunula pendant with raven symbol. The Lunula Pendant Sterling Silver Female Charm viking-workshop has been in production for many years, and during this time we have made thousands of our customers happy with these unique items of the highest quality! Owing to the silver base of the products, there is no need to worry about the pendant losing its appeal over time. Our craftsmen also ensured excellent wear resistance of the pendant, so you don’t need to be afraid of the daily mechanical load. 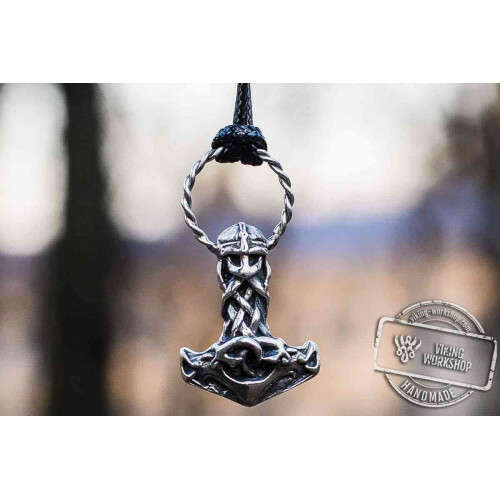 In particular, you can wear this pendant with the any other (for example, Thor’s hammer), and both products will retain their original appearance for a long time!